​AMERITEMP AIR RENTAL COOLING, MOVIN' COOL, THERMAL CARE, CARRIER TRANE, YORK, and AmeriCool. How often have you needed an immediate solution to a heat or humidity problem in a CRITICAL area? Here's our solution. Our full line of self contained portable air conditioners and dehumidifiers are uniquely designed systems which allows installation in minutes to cool down hot spots and eliminate high humidity. We engineer solutions to meet the specific needs of each applications. 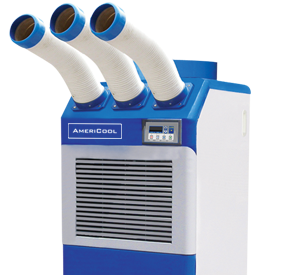 We stock and supply a large variety of portable air handlers, backward inclined blowers, and portable air circulators. SERVICE AmeriTemp offers a number of important services to our customers. A phone call to our 24 hour service department for assistance will always be handled by a person who understands our equipment and its application to your particular job site. Our technical people combine years of experience in the construction and industrial heating field. Because we have complete engineering, fabrication and service departments, we have more flexibility in custom installations, and continuous product support. We provide the fastest response time in the industry on delivery, repairs, and customer requested modifications thanks to our 24 hour computerized dispatching center. Move & Cool Air Conditioners are portable 5 ton self contained air conditioner or some call it 5 ton portable quik kool ac.. These commercial 5 ton mobile air conditioners are great for office cooling. - Totally self contained rugged design and economical. - Operates automatically after hours or during weekends. - Quick, easy and cost effective to install.